See the new way to press Tofu – and More. Welcome to TofuXpress, the new way to press tofu. Everyone knows tofu is great for you. It’s a great source of protein, low in fat, high in nutrients like calcium, and versatile. 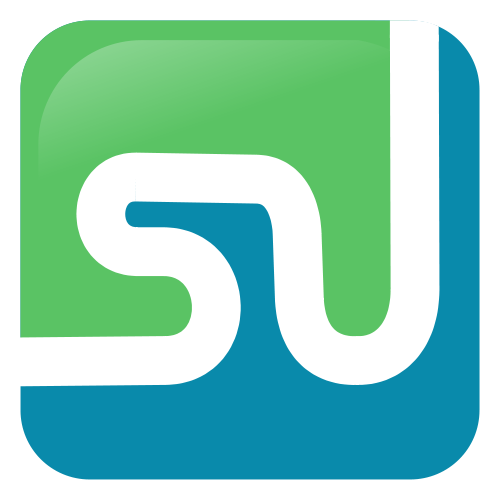 It’s the protein of choice for those that choose healthy eating over high fat proteins. And its not just for vegetarians any more. Everyone also knows it’s not easy to prepare for cooking – its watery, has a slight flavor, and a very soft texture. It’s hard to grill and lacks a chewy texture. 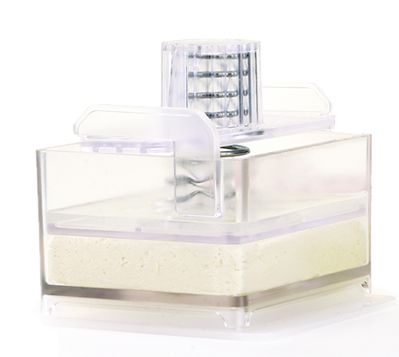 Draining tofu and pressing tofu can be messy and cumbersome. The TofuXpress makes pressed tofu incredibly easy! No more plates, weights, cutting boards, and paper towels that end up in the trash. 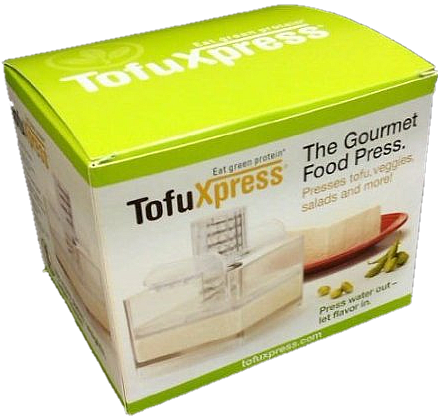 The TofuXpress, the gourmet food press and tofu press is simple, clean, compact, durable, and very easy to use! Now you can marinate tofu too. 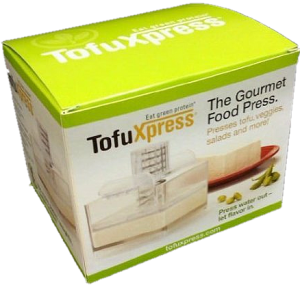 Press tofu then add a marinade and make marinated tofu all with the TofuXpress. Baked tofu is great once you press your tofu. Press tofu and then bake tofu. And you can even fry tofu! Who would have thought you can even make Tofu Crème Brulee! This kitchen tool is no one-trick pony. It works great in making macrobiotic pressed salads, paneer cheese, yogurt cheese, and Greek-style yogurt. 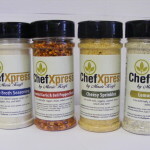 The TofuXpress presses veggies too. No more messes with chopped spinach either. 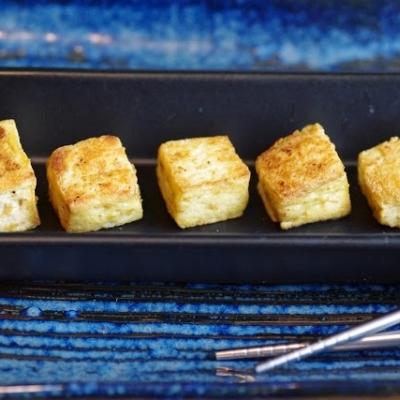 Grilled tofu is possible with this versatile tofu press. Grilling tofu now actually tastes great and the texture is meatier. The TofuXpress Gourmet Tofu Press and Food Press is the kitchen tool for the home chef and foodie that wants to eat more Green Protein TM, Plant protein, and leave a greener footprint! The Tofuxpress has been featured on about.com and was highlighted on ABC’s World News with on Diane Sawyer “Made in America”. Grill tofu, bake tofu, marinate tofu, press tofu, drain tofu. Its changing the way the world thinks about tofu!